The louvers look a bit radical since you have those clean lines at the back...but it might be fun to try cutting some (mid)sections of the louvers and see what happens.. I love the louvers. They look nice. The car is looking fantastic. Glad to see you dropped the hurse idea. The car kinda reminds of some of the older muscle cars. The back end does with that long window. I was going to reply last night and say no. But looking at it today I'm reconsidering. Since the glass is clear, from a distance it might look like an elongated notichie. But, with the louvers it gives it some shape. Also, the black louvers will contrast nicely with the orange paint or whatever bright color you might paint the car. But, one the other hand. It is a shame to hide that engine. I like them, if you are going to add Louvers then they should be as bold as the car they are on. The aluminum ones are better looking. I used to sell both the plastic and the aluminum ones, nobody bought the plastic ones. dude, louvres are from the '80's. ditch them. Louvers makes it look so 80sh. It has great lines which the louvers just brake off. I'd say the Louvers could look kinda cool. They seem to be a little large, kinda like shark fins. I'd say either use some of that bubbajoexxx insanity/genious and do something with them to make them look better, or get rid of them all together. Dude the car was made in the 80s lol... I think they will look pretty cool once they are painted. And if they dont Like Bubbajoe said they are removable. shave the pontiac arrowheads off the sail panels. this sense that you folks have that the 80's are old - is old! the 80's are retro now, have you seen the pink prep shirts, collars up and all? i kinda like the louvers, but not sure you should cover up the engine, but . . .
the 80's louvers would be cutting edge now! Hey Bubbajoe, what's going on with the sidemarker where it meets with the rear bumper molding? Doesn't quite look right in the pic. Optical illusion or work-in-process? Louvers are making a comeback! I LOVE the car, but I am not a fan of the louvers. They take away from the beauty that you have created. So - remake them in CLEAR! Possibly with blacked edges fading quickly (few inches?) into the middle. Get the look, and still get to see the artwork under glass! The louvers are simply not part of the natural beauty of this creation. I usually don't like louvres but those don't look like your typical 80's louvre. I like them. Besides, it looks a lot less 80's than the notchback look does. HI Joe I was looking at your work today and it looks really nice that gray primer looks white maybe white could be the right color for this car. Not sure but it's starting to look like something I love all your hard work and really great job for the weather you have to work in. You know not me I like it hot. Hope to talk to you soon always like talking to you just not sure when your not so bussy. Bobby! The louvres are removable, right? So you can have your cake and eat it too, eh? Drive with 'em on, or off...? I like the car both ways, but it depends on what YOU like. It's YOUR baby..
You've done some great work on this car! Why not base it on the C5 knuckles Bubbajoe? They are even reasonably priced new, and you can use C4 hubs in them like you did in back (with a fabbed nut to hold it together). If you can't find the C5 front control arms you should be able to fab your own tubular arms, or maybe even find some stock car arms in the right lengths. We discussed this in the racing thread but never pursued it any further. 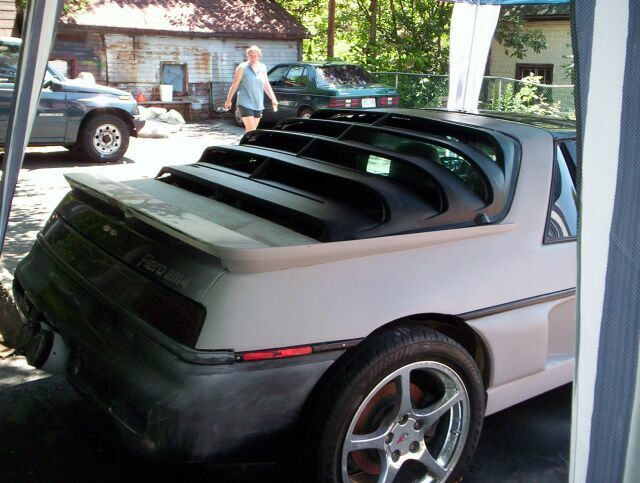 Gusshotrod did some preliminary software design and felt it should be a great setup for the 84-87 Fiero. The car is looking awesome!! But put me down for a vote against the louvers. They look alright, but the point of louvers is to lower the amount of sun comming into the passenger compartment. They serve no real purpose on your car except to hide the engine and reduce, (further) your rear visibility. But it's got a LOT of anti-dive, which is not what a mid-engine car necessarily needs. Getting rid of the anti-dive is difficult because the UBJ boss on the knuckle is angled back. A couple of things you might want to watch out for using C4 spindles. It might be difficult getting a long enough upper a-arm in there, and the kingpin offset might cause the tires to hit the body at close to full lock. The ball joint in the spindles are in line with each other, as are all spindles, so anti-dive isn't an issue with the spindles. You might want to use a shorter rack, I would suggest a mustang 2. You will also most likely have to fab steering arms to get the bump correct. I have some C4 spindles/hubs/rotors/calipers if you need them. By the way, I thought that the C5 design was so much better than the C4 that I redid the entire front end of my car so I could use them. One other thing: The C5's seem to have a problem with severe rear end lift under hard braking. You might want to look into this. The ball joint centers are in line, but AIUI, the boss on the knuckle is angled back.